Quantitative Determination System for Azides. This system uses disposable QuantTab™ Azide cards which change their color quantitatively based on the concentration of the azides. The QuantTab™ is placed into an electronic reader that is hooked into any windows based computer to quantitatively measure the concentration of azides in a solution. The provided software quantifies the color formed, displays the azide concentration and saves a record of the results for each sample for tracking and fruther evaluation. More information can be found here. 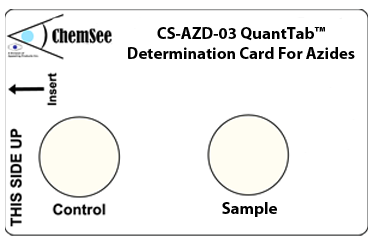 The Azide Determination Cards detect concentrations of 10 ppm Azide or greater under neutral pH conditions. The user can obtain a semi-quantitative assessment of the concentration by using a visual color comparison with the printed color chart on the card. 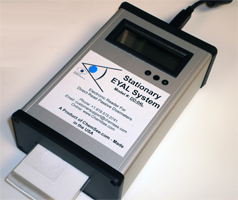 In order to obtain an exact quantitative assessment of the concentration, the user can purchase a EYAL™ DD-04L-AZ Quantitative Reader. The EYAL™ DD-04L-AZ Reader allows for fast, quantitative determination of Azides in solutions using the QuantTab™ Azide Determination Card. Determination in the range of 0 – 250 ppm Azides can be easily accomplished, in neutral pH conditions. Sample preparation pouches for alkaline samples are avaliable upon request.The provided software, quantifies sample concentrations and keeps a record of the measurement so that trends can be tracked and monitored over time. Reduces the Azide concentration to below detectable limits and produces a solution which can be disposed of with normal wastewater (provided no other contaminants are present).